94cm by 68cm approx. satin banner with beautifully embroidered heroes of Binh Gia badge showing advancing Viet Cong soldier with camouflaged cap, rifle and HCM type sandals made from old car tyres in from of large Viet Cong flag to centre. Top reads "Armed Forces for the liberation of South Vietnam ." Bottom reads "Binh Gia offensive 1968." 74cm x 54cm approx. cotton battle flag with beautifully embroidered yellow star to centre. ​Top reads "Armed forces for the liberation of South Vietnam"
​Bottom "Liberate Quang Tri 1966." 75cm by 53cm approx. cotton battle flag with beautifully embroidered yellow star to centre. 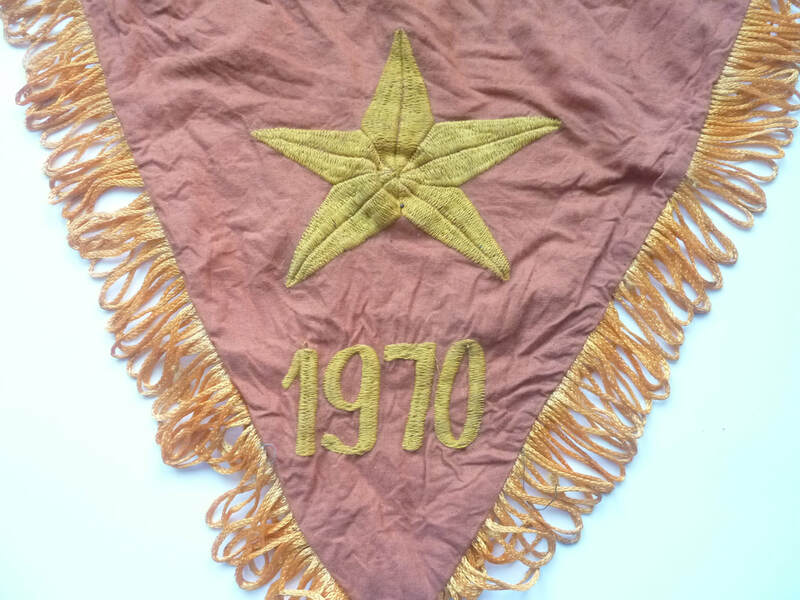 Top reads "Armed forces for the liberation of South Vietnam"
74cm by 54cm approx flag with beautifully embroidered yellow star to centre. ​Bottom text "Liberate Saigon 1975"
​Saigon being the capital of South Vietnam falling 30th April 1975 ending the Vietnam war. 73cm x 60cm approx. cotton battle flag with beautifully embroidered yellow star to centre. ​Top reads "Armed forces for the liberation of Vietnam." ​Bottom "Da Nang offensive 1968." 73cm by 53cm approx. flag with beautifully embroidered yellow star to centre. Top reads "Peoples front for the Liberation of South Vietnam"
Bottom reads "Liberate Quang Ngai 1968"
94cm x 68 satin banner with beautifully embroidered North Vietnam Army soldier charging forward with AK47 rifle and large North Vietnam flag with Viet Cong text, soldier is supported by air and tank support. 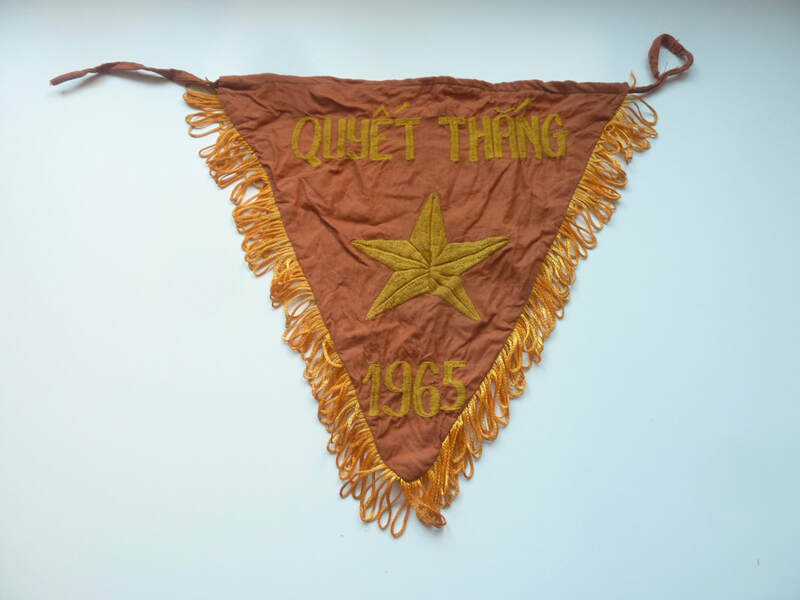 ​Bottom "Liberate Kon Tum 1965"
92cm x 66cm satin banner with beautifully embroidered picture of Viet Cong heroes against US aggressors medal to centre. ​My Tho saw much Viet Cong fighting throughout the war. 72cm x 52cm cotton battle flag with beautifully embroidered yellow star to centre. ​Bottom "Khe Sanh offensive 1968." 73cm by 52cm approx. cotton battle flag with beautifully embroidered yellow star to centre. ​Bottom "Liberate Xuan Loc 1968." 96cm by 68cm Satin Banner with beautifully embroidered picture of Viet Cong soldier with rifle and ammo belt in front of large Viet Cong flag with air and tank support. Top reads "Armed forces for the liberation of South Vietnam." Bottom "Liberate Binh Long 1966." ​Bottom "Can Gio offensive 1967." ​Bottom "Liberate Phu Yen 1967." 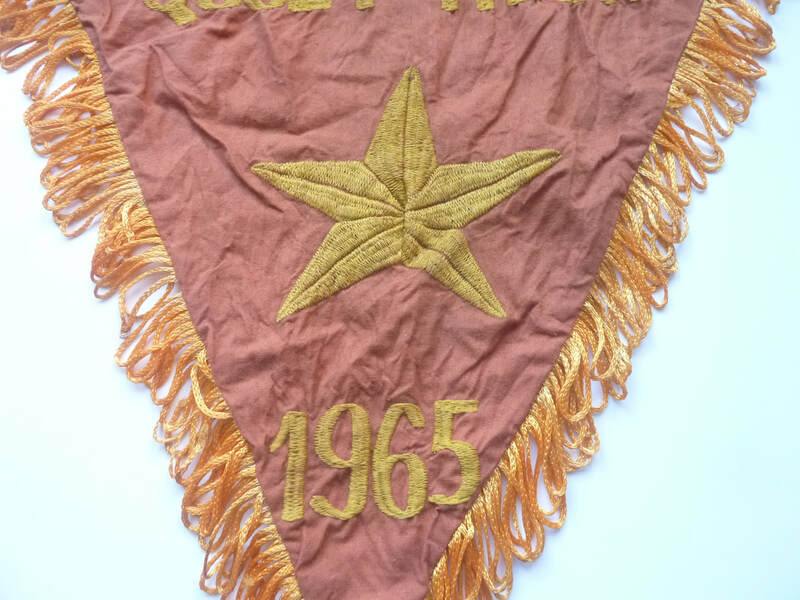 North Vietnam Army 1968 Vietnam war cotton battle flag 74cm x 53cm. Top text "Armed forces for the liberation of South Vietnam." Beautifully embroidered yellow star and wreath to centre. Bottom text "Liberate Hue 1968." Viet Cong, Vietnam war era 95cm x 68cm satin banner, with beautifully embroidered picture of Viet Cong soldier charging forward with rifle and sandals made from car tyres in front of large Viet Cong flag. Citadel and North Vietnam flag in the background. Top text "Armed force for the liberation of South Vietnam." Bottom text "Liberate Gia Lai 1969." 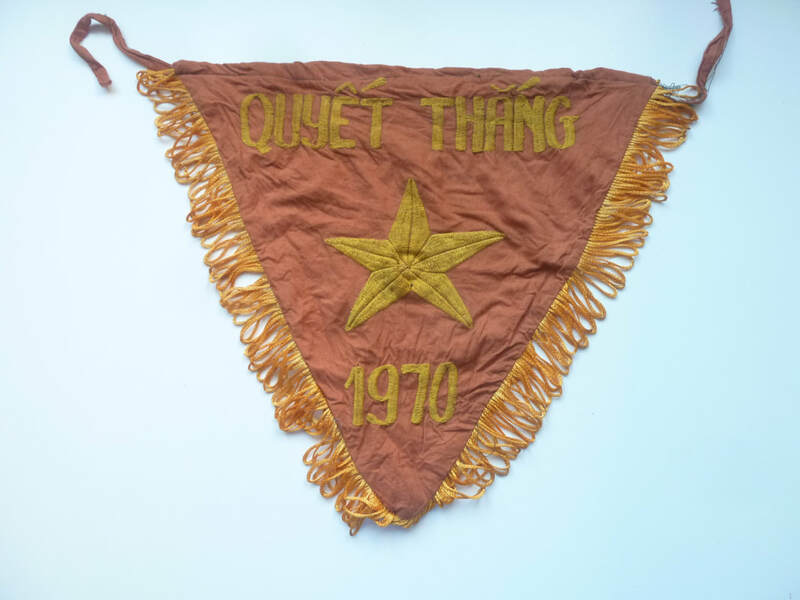 Viet Cong, Vietnam war era 95cm x 70cm satin banner. Centre has heroic male and female Viet Cong fighters with hand grenade, rocket propelled grenade and AK47 rifle in front of a Viet Cong flag. Bottom text "Liberate Hue 1966." Small Viet Cong Vn war era battle flag. Would have been mounted on a long wooden pole for identification during battle or mounted on the aerial of captured vechiles. Cut out and onset yellow star to centre. Good overall condition, but a little but dirty, could probably be washed if required. Difficult item to find. North Vietnam army 72cm by 60cm cotton battle flag. Bottom reads "Liberate Play Ku 1967." North Vietnam army 72cm by 55cm cotton battle flag. Top reads armed forces for the liberation of South Vietnam. Centre has beautifully embroidered yellow star to centre. Bottom reads"Dong Xoai offensive 1965"
North Vietnam army 74cm x 62cm cotton battle flag. Top reads "Armed forces for Vietnam"
​Bottom text "Khe Sanh offensive 1968." 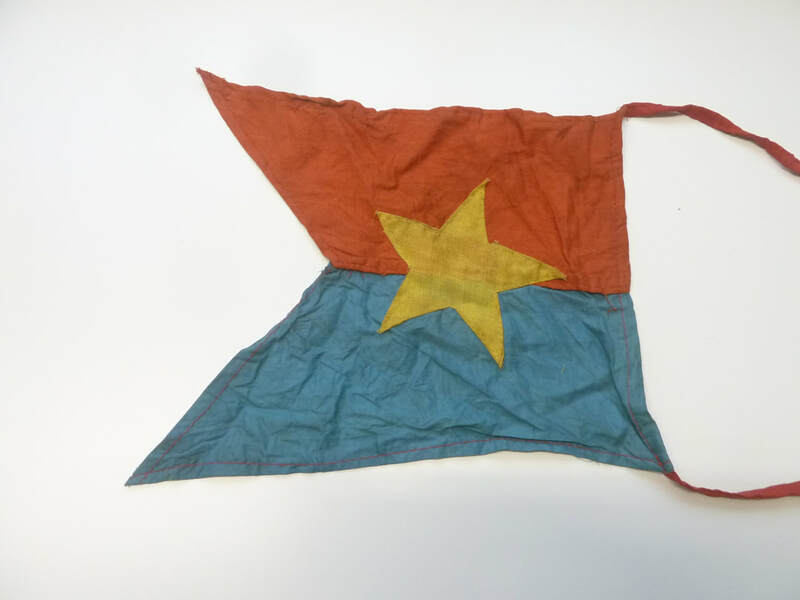 A 50cm by 36cm cotton flag North Vietnam army Vietnam war ere vehicle flag, from the Vietnam war era with cut out and onset yellow star. 39cm tall pendant, text resolve to win 1965 with embroidered yellow star to centre. 39cm tall pendant, text resolve to win 1970 with embroidered yellow star to centre.